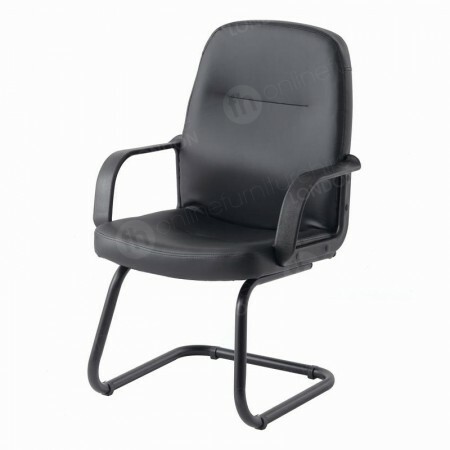 Smart and extremely comfortable our black operators chair without arms is a really professional looking product and has very innovative features too. Being adaptable, it’s a great ergonomic option when you’re looking for a classy product that also has fantastic innovative benefits. Seating design has generally always taken account of two very important features of chairs - what they look like and what they can do! Before the 17th Century most seats were made of wood and although there were different metals to experiment with, in general a lot of seating was manufactured using just timber, but halfway through this century things began to change. At this point, the comfort of seating improved dramatically as upholstery and cushioning began to be added. As well as improving what it felt like to sit on them, newer materials, like silk and velvet were added and some truly opulent chairs were produced. From around the 14th Century seating started to become more in use by the general population, before that, chairs were most associated with rulers, aristocrats and royalty. As appeal broadened, designers found a market opening up and chairs have since become very diversified with different models for specific uses. Comfort has always been a very key element to office seating, and when workers are sitting at their desks for much of their day, it’s essential that they feel comfortable. In the 1970s, a British inventor called Fred Scott set about designing a very innovative product, in order to compete with models that were being produced across the pond in the US. In 1979, he unveiled his Supporto creation. The name of this item gives a bit away about why it was produced in the first place. Scott was dedicated to creating an adjustable seat, which is exactly what he did, and elements of his creation have evolved and are still in use today. The Supporto has all the bold lines and curves that were popular during this decade, it was upholstered and the seat height could also be adjusted. These kinds of features are just as important now as they were then. You only have to take a look at some workstations to see that ergonomics has been adopted into health and safety practices throughout many companies, as they reduce the chances of workers getting injured or suffering from muscle tension. Ergonomics suggests that we try and keep our bodies in balance as much as possible, even when we’re sitting very still. Tips include keep thighs and forearms at right angles to our body and making sure our feet are flat on the floor. 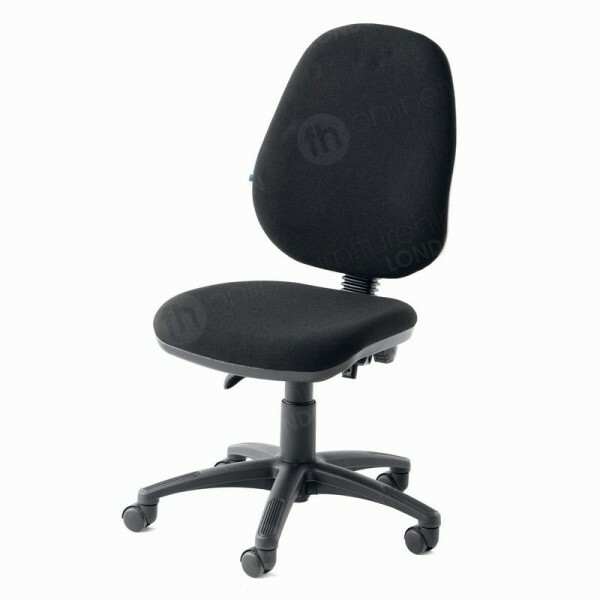 Our black office chair hire range really assists you in doing this, and features levers that adjust both the height of the seat and the angle of the seat back. All these benefits combine to produce a very comfortable product, which is further enhanced by the deep cushioning and the lumbar support. You can be confident that when you order this seat, you’re selecting an innovative item, that feels great to sit on for hours and hours at a time. But, this item also looks fantastic too. 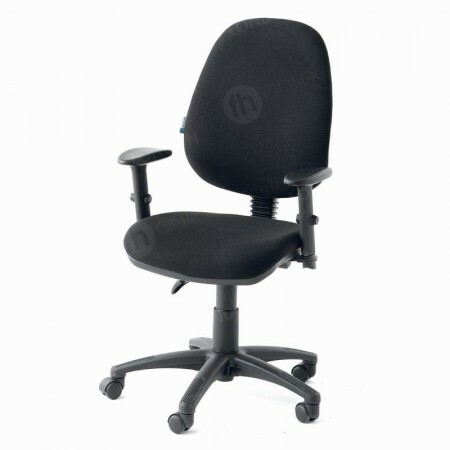 For added stability why not try our Jenson chair instead, which features arms too. You're able to order both these models in blue, if you finish is a better fit for you. With it’s black base and black fabric finish it’s absolutely perfect for those corporate locations where it’s essential to have smart looking workspaces. For the same reason it also looks great in receptions and meetings too, while the adjustable benefits make it a top choice with our customers working in the beauty industry. 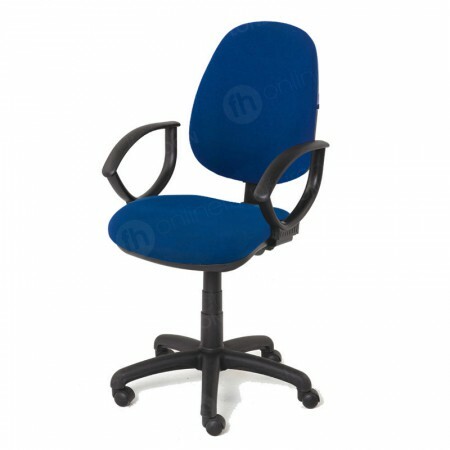 This is a very solid and stable chair, and an excellent model to use throughout your business or organisation. Because it’s wheeled, you’re able to move it around workstations and wider premises with ease. Being mobile in this way means users can quickly join in with impromptu meetings, or move seating to another room for presentations for example. Are these suitable for multi-use in offices? Yes. They are smart, chic and perfect for when you’re sitting at your desk, but they also complement receptions, boardrooms and training rooms really well too. The wheeled base ensures they are simple to move between locations. 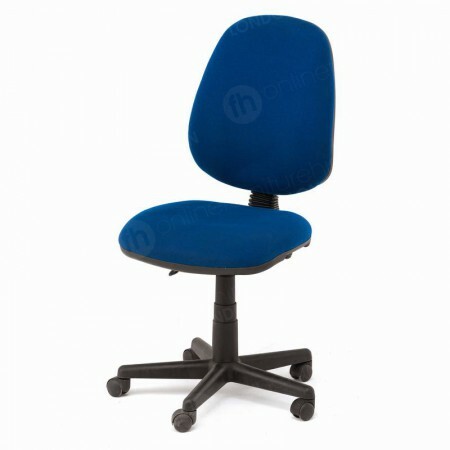 I need a comfortable conference chair - do you recommend this product? This is a great conference chair, because it’s very professional looking and can be adapted for every user. When you need chairs that stack and are holding a very large event you may also like our stacking chairs, which are also very smart in appearance and are upholstered. How easy is it to adapt the chair to my height and preferences? It’s very straightforward! Connected to a gas-lift mechanism you can easily adjust the height of the seat with one lever, while a second changes the angle of the seat back. Can I place a smaller order for a longer hire period? Yes - you’re the customer and you can choose exactly how many items are in your chair hire order, and the length of the rental period too. We offer fantastic deals, and when you choose our long term hire, you’ll find the rates are even cheaper than if you bought the products concerned!